Our Free-Standing Seed Cake Store Displays offer a great “impulse buy” opportunity for your customers. The displays can also be customized to fit your specific store needs. Convenient and easy-to-use, these free-standing displays are a great way for your customers to find exactly what they want. They’re shipped filled with a pre-selected assortment of seed cakes to satisfy your customers needs. 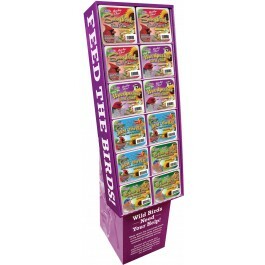 Brown’s® has developed the ultimate in gourmet Garden Chic!® Seed Cakes in four bird-specific blends. They’re filled with real fruit, nuts, delectable seeds and blended with pure golden honey. They’re then hermetically sealed to lock in freshness, making them ideal to feed year round and convenient to use. Easily fitting into the wire baskets used to hold our suet cakes, Brown’s® Garden Chic!® Premium Mini Seed Cakes reduce the mess and last longer than loose seed.